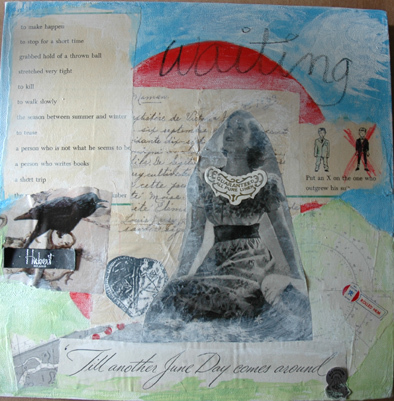 A 12″ square deep gallery wrapped canvas with mixed media consisting of painting and collage, with a tad of journaling. There is to be a solo show in September after all plans were finalized in the last couple of days. The wall space is large and there is a table also for smaller works. I will be working throughout the summer, thankfully indoors, completing works for Trashion Fashion photo shoot in late june and the event July 21, and then for the show in september. 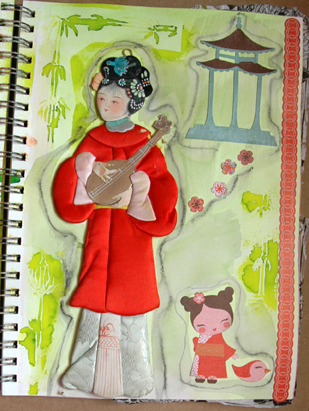 Lots to do, just getting my feet wet today and back into mixed media from the accessory frenzy in May. A new page in my watercolor journal. I’m calling them Poem Pages. 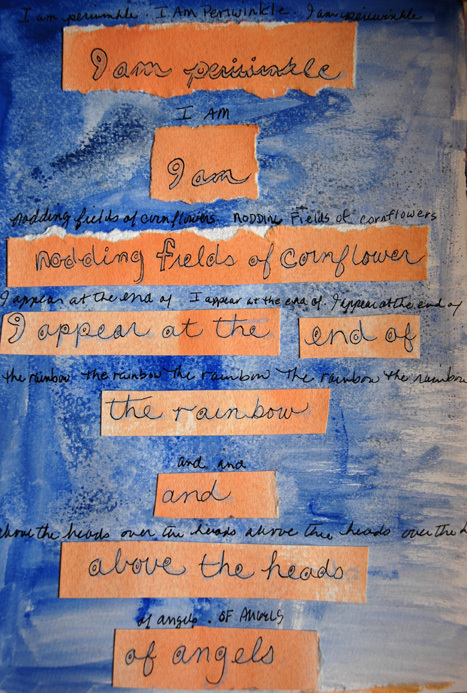 The journaling derives from a writing assignment having to do with a favorite color and “I am” statements. The poem is written on watercolor paper and then washed in a light to medium tone. The statements are cut out and perhaps rearranged into a poetic collection. From there is is a matter of rewriting the poem in pen and doing some outlining of the handwriting to make it pop. I think it looks cooler in person than in the pix, plus it’s very overcast here today so not a lot of light in the photography station (ha! my dining chair in the kitchen!). Pick your favorite anything, write out what it’s like to be it, and make a poem today in your journal. 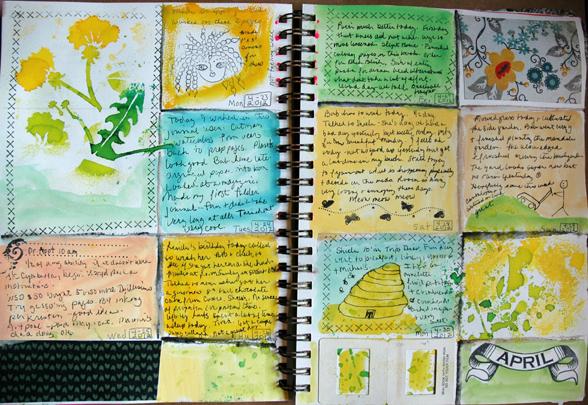 This exercise will appear as Class Three in Art Journaling at Whim So Doodle in St. Pete, FL sometime in July. A bunch of stuff graces this page. The background was spray inked and I stamped a hand carved dandelion plant image (from Quik Cutz, not a styrofoam plate this time) onto the foundation. Then I began to layer on some ephemer. There are ration stamps, an epsom salt RX envelope, business cards, word cards, more RX labels and some Victorian scrap, plus a lotteria card. 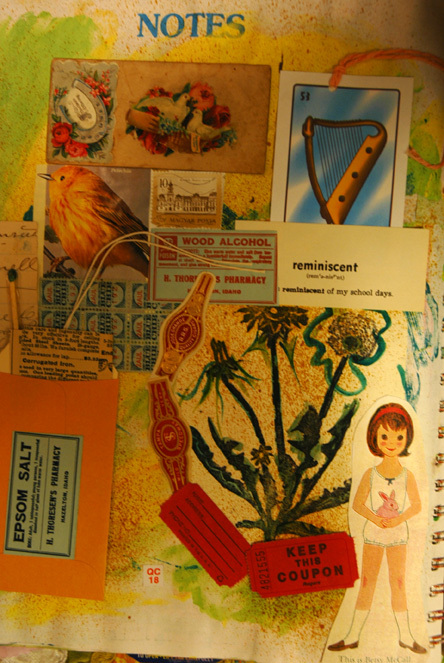 The cigar bands and red tickets create somewhat of a border around the dandelion image, and a cute little girl from what could be a paper doll sheet finishes the edge. This page does not feel finished to me. I think it needs a very thin wash of gesso or white acrylic to unify the items, or some journaling in white would accomplish the same idea. 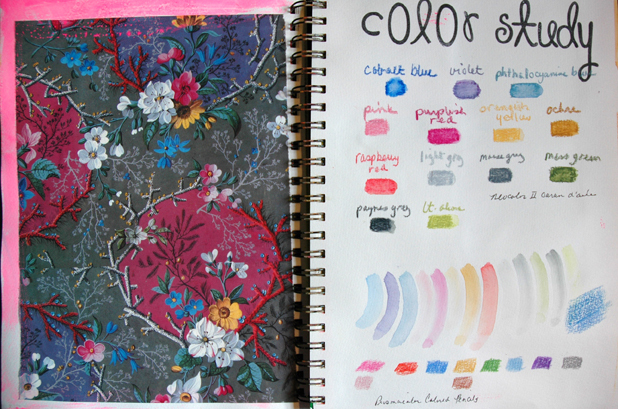 One thing that I love to do in my journal (as much so I can find them later as any reason) is color study work. I try to find some really unusual, prolific color choices in a piece of art or in ephemera, in this case some artists’ gift wrap from the turn of the century. I believe this was included in a collection of papers that I bought from Borders quite some time ago; they are unusual in the extreme, some of them so “busy” as to be hideously attractive which can move very quickly to plain hideous if the artist isn’t careful. This paper was the first one to catch my eye one day when I had the urge to do a color study. Here’s the way I go about it. I will take a medium, in this example the top color blocks are Neocolor II Caran d’Ache watercolor crayons which I super love and have a large set of. So I go thru the stash and pull out the closest matches to the colors used in the papers. I write the name of the color above the swatch. Underneath the boxes of color you will see some brush strokes where I did a more translucent sample. The blocks at the bottom are Prismacolor colored pencils. You might like to know the purpose of why I do these studies. First of all, I just like doing them, they are fun and spur me to get the supplies out and reacquaint myself to them. Secondly, they illustrate what a wild color scheme is actually made up of…perhaps when you look closely to do the study you see 2-3 colors there that weren’t obvious before. Thirdly, when you lay the colors out to the side in boxes, they look really cool and nothing like the wild pattern you’re trying to study and fourthly, now I have a color palette that I never would have come up with on my own, that I can translate into my own painting or bead work. Plus, it is a palette that is quite original and not the fad or fashion, but it’s played itself out in front of you so you know that it (or a combination of some parts of it) are going to work for you. So the whole reason I show you this is for you to shake the dust off your materials and find a piece of paper or fabric or artwork that is a riot of color and sit down to match up and document that article. Maybe you can come up with another 4 reasons to do it that I haven’t thought of yet. If so, please LMK. 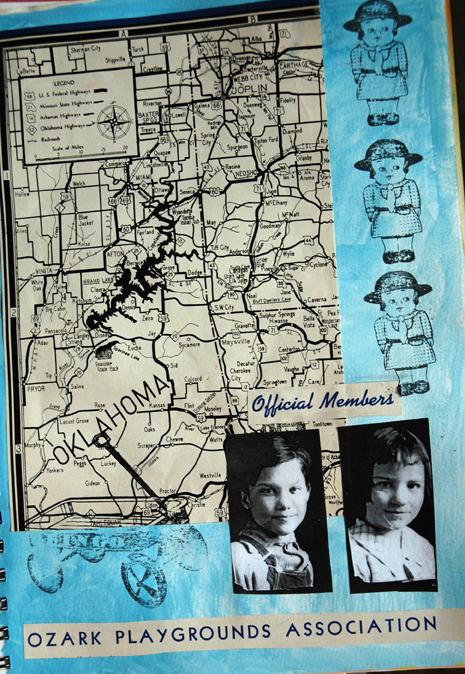 These school photos were blown up on the copier and turned into portraits for display in the Ozark Playgrounds Association handbook. Official member boy has his Bingo wagon with him, and Office member girl brought her doll. I will very likely white wash the map so that I can journal in that space ultimately. I finally remembered I have rubber stamps to use in my journal with this new journal and have been trying to pull some out and print. I almost always stamp in black ink, although I have other colors, and I almost always use Staz-ON even though I have other brands. I like that Staz-on goes over anything and under water and mediums. I am sure not the world’s best stamper as you can tell, but I even like when the images is rough, sort of like an abstract memory in this case. Half faded away.